Blossom of apple trees, impressive summits and pure nature. Termeno is a perfect place for spending one's hiking holidays, especially in spring and autumn. Spring season catches the eyes of its visitor above all thanks to the blossom of apple trees, while in autumn you can enjoy walking throught the fruit orchards and vineyards in the last warm days of the season. The Corno di Trodena nature park as well as the various biotopes in our region make hiking holidays in Termeno and surroundings simply an unforgettable experience. Moreover our guest get the Winepass ticket that enables them to use most of the means of public transport and access lots of South Tyrolean museums for free. However, you don't need to go far, as the area between Cortaccia and Appiano has many places to be discovered on foot. An absolute must do is our local mountain Roen (2,116 m), which can be scaled from the village of Termeno, located at 260 m asl. As you might notice, the area is both suitable for beginners as well as for experienced alpinists. Twice a week the tourist association of Termeno offers guided walks in which our guests can take part in for free. Twice a week this tourist association also organises a hiking weeks. 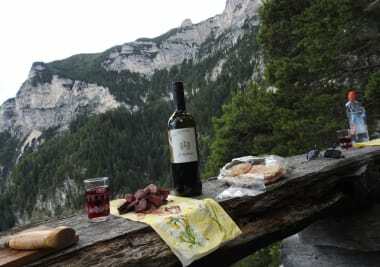 In spring there is the blossoming hiking week and the vintner's hiking week is organised in autumn. In addition, we have an in-house hiking guide and a wildlife and forest educator who provides advice and help when planning your tours. We also offer guided tours for our guests almost every week. The absolute highlight for hikers are the hiking weeks in the hotel Arndt in Termeno. In these weeks we take you across the hiking region of South Tyrol 4 times a week.